in Mens C and Dan Breen and Shane Walsh in U23 B Grade John Fitzgerald in the men`s Challenger plate and Mark O`Donovan Also participated. for Stephen as he is minor next year. defeated 21-12 in his All Ireland Final. in his 1st round winning 25-2, he then played Mark Quinn(Longford) and beat him 17-9 to qualify for the National Final against Shane Walsh(Windgap). Shane started of well when he recorded wins over John Kerreher and Niall Mannion (Roscommon) in the early rounds on Saturday. In the semi final he beat Christopher Mckenna from Monaghan. 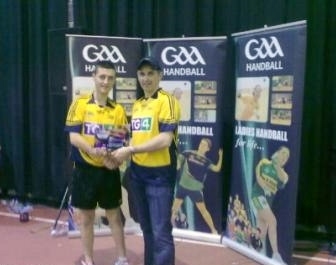 winning his first ever Singles All Ireland having lost out in the U23 B 40x20 All Ireland in April.